Be Advised: There are multiple meanings of the term "IFAK," depending on your branch of service! The Army, Marines, and Air Force have very different IFAK's, with completely different sets of components. *NOTE: USMC IFAK is sometimes referred to using an alternate NSN, 6545-07-000-0762. See below for information on USMC IFAK Components, which have recently changed. "Product Description: The IFAK will be issued to every Soldier via the Soldier as a System (SaaS) Rapid Fielding Initiative (RFI). Weighing one pound, the IFAK will consist of expendable medical items packaged inside of a modified MOLLE 100 roundSAW ammo pouch. 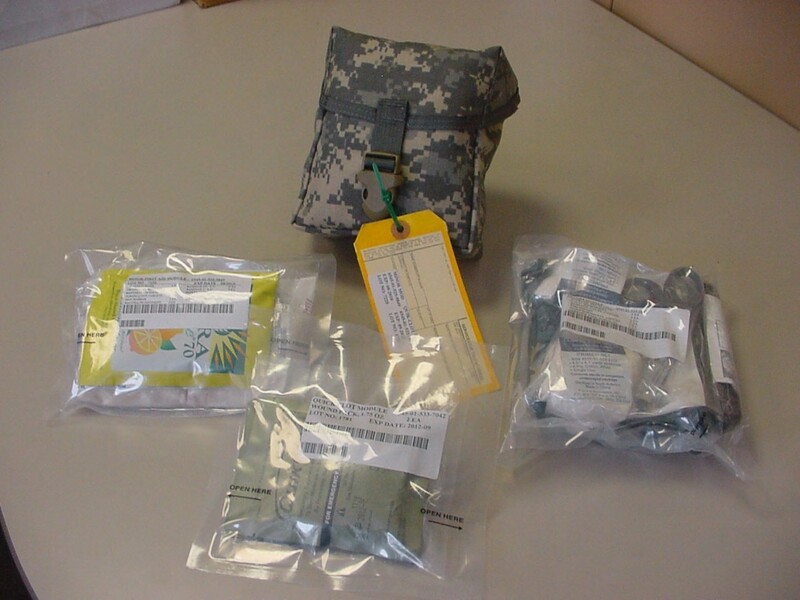 Benefit Against the Threat: The IFAK increases individual Soldier capabilities to provide Self- Aid / Buddy-Aid and provides interventions for two leading causes of death on the battlefield, severe hemorrhage and inadequate airway. These capabilities increase Soldier survivability during dispersed operations and the expandable pouch allows for METT-C specific ìadd-insî. Fielding and Ordering Guidance: The IFAK is included as a component of the RFI fielding schedule and will address all deployed and deploying units. The IFAK is AAC ìLî (local purchase) and units are able to purchase additional IFAKs via standard Class VIII methods. NSN: 6545-01-530-0929." This is the configuration of the IFAK that has been shipping for about a half-decade. However, a newer and much more-expensive USMC IFAK configuration is available (if requested), which replaces the 2ea H-bandages with 2ea CAT Tourniquets. It also adds Quikclot Combat Gauze. If you would like to purchase this newer configuration, please contact us at (703) 269-0013 for pricing and availability. (1ea) 3.5 oz. Quikclot Packet - NSN 6510-01-499-9285 NOTE: As of 31 AUG 2011, the USMC IFAK is no longer shipping with Quikclot powder.